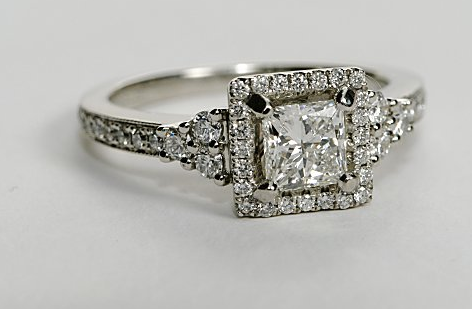 Absolutely enticing designer princess cut engagement ring. 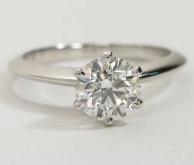 If you’re looking for a plain, simple engagement ring, look elsewhere. 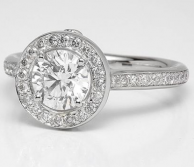 However, if you’re looking for a stunningly detailed designer ring, take a closer look at this one. 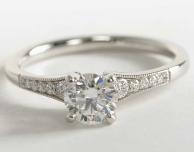 Starting at the top, you can select a beautiful princess cut diamond to be the center piece. 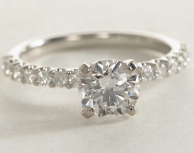 It will be immediately surrounded by a halo of diamonds. Going down the ring, 3 larger pave diamond sidestones will adorn either side. 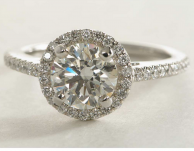 Further down, regular pave diamonds accent the setting, kept in line by an intricately detailed outer edge. And one more detail — there are 2 pink sapphires on the prong of the center diamond!